House prices to rise by just 1% this year, says leading lender. Shrinking household incomes and affordability problems in London and the SE will subdue demand for homes, according to report out this morning from the Nationwide. House prices will rise by just 1% this year, the latest house price report from the Nationwide reveals, returning to growth only in the “the longer term”. The lender says the average house price increase last year was 2.6%, down from 4.5% during 2016 as housing affordability problems and mounting pressure on household incomes continued to put the brakes on activity within the property market. Despite this, during 2017 all regions of the UK experienced house price gains except London, where they dipped by half a percent. 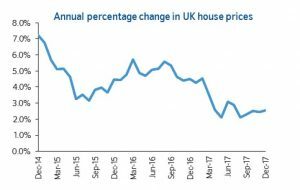 “The major surprise during 2017 was undoubtedly the slowdown in London house prices. It’s been 13 years since the Capital sat at the bottom of the house price growth table, and since then we have seen prices surge to unprecedented and unaffordable levels,” says Alex Gosling, founder of HouseSimple.com (pictured, left). “Fortunately, there’s no longer the reliance on the London market to prop up the rest of the country. Growing regional business hubs have seen other major UK cities prosper, while London has suffered as property prices have become unaffordable for the majority. The West Midlands was the top performing region in the UK last year for house prices, where they rose by 5.2% year on year to an average of £182,861. The UK average is currently £211,433, the Nationwide reckons. The Nationwide is also worried about the size of deposit that many first time buyer must now save up, particularly in London and South East. In the capital its figures show that the average deposit has risen from £55,000 in 2007 to £80,000 last year, and from £38,000 to £50,000 in the South East. “It is arguably even more challenging to save for a deposit than it was a decade ago, due to falling real earnings – i.e. after taking account of inflation – and lower interest rates for savers,” says Robert.